If you've seen it, you won't forget it: The moment a New York student played Pharrell a song and gasted his flabber. 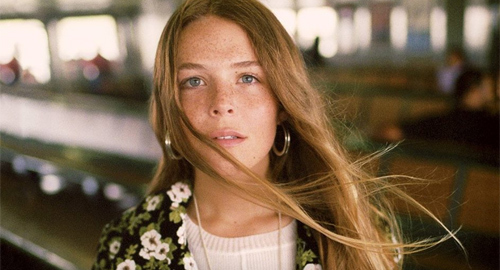 Her name was Maggie Rogers and that viral video launched her career. Well, kind of... She'd already released two folk albums, which relied heavily on the much-maligned banjo. But her new music, inspired by a Damascene conversion to dance music, took those basic sounds and created something genuinely new and (crucially) great. That's what made Pharrell's ears prick up. Rogers, as you can see above, found the whole experience excruciating. "I felt like I was showing my homework," she told the NME. "It was very uncomfortable listening to my music in front of my peers, then you add a camera crew and one of the most powerful music influencers. I pretty much picked a spot on the floor and stared at it. I didn’t really know what was happening or how excited he was until I saw the video... and I’ve only really seen it once. We’re not in touch; That was my whole interaction with him." After the video went viral, Rogers worried she'd become known as "the Pharrell girl". To be brutally honest, that's going to be the case for the foreseeable future - but luckily she has the material to back it up. Her second single, Dog Years, was further evidence of her ability to fuse memorable melodies with inventive production. The new one, On + Off, veers even further into pop territory. There's a hint of Sia in the chorus, but Sia wouldn't be able to resist smashing that hook over your head. Rogers is elusive... Every time you think you've got a grip on the song, it shakes you off and beckons you back for more. It's devious. It's delicious. I can't resist. On + Off is track three on Now That The Light Is Fading, Rogers' debut EP. It "drops" on 17th February.